Welcome to the Historicity, an International Research Journal of History. 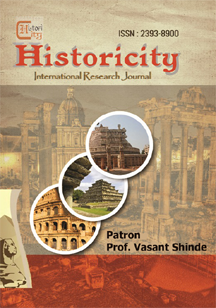 Historicity is a peer-reviewed Journal published monthly in electronic format. Historicity aims to publish original research articles, reports and reviews with an emphasis upon emerging and on-going debates relating to all areas of History addressing complex historical issues. It is indexed in Directory of Research Journals Indexing (DRJI). The peer-reviewed Journal of Historicity is dedicated to the advancement of scholarly understanding of the history and will publish monthly. It offers explorations on any aspect of history to a broad audience of historians. The Historicity is unparalleled in its efforts to choose articles that are new in content and interpretation and that make a contribution to historical knowledge. The journal also publish surveying and reporting the most important contemporary historical scholarship in the discipline. The editors invite manuscript submissions of between 25-45 pages (approximately 8,000-10,000 words), which relate to topics related to any aspect of history.